View license information for fixed licenses that have been activated on the machine. Configure the License Manager to be the Floating (Network) License Server. Add and activate floating licenses to the License Manager. Return fixed and floating Licenses that have been activated on the machine. DriveWorks License Management should be installed along with each application that a Fixed License has been purchased for (see License Types below for information on the license types available for each DriveWorks Pro module). Doing this will allow you to view the license information for that product and also return the license should you require it to be re-activated on another machine. 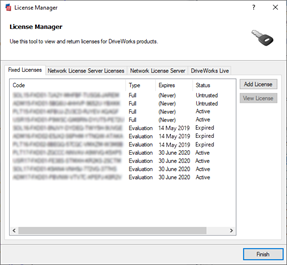 When a Floating License has been purchased, DriveWorks License Management should also be installed on a machine that acts as the License Server. Please see Multi-application Deployment in the section Deployment Scenarios in the article How To: Deploy DriveWorks Pro for advice on where to locate DriveWorks License Management. DriveWorks Pro 3D Viewer *Not Required * 3D Viewer is a free tool included in the DriveWorks installation package. It allows DriveWorks 3D (.drive3d) and Stereo Lithography (.stl) files to be viewed. ** Pro Server is a free tool included in the DriveWorks installation package. It is used to manage the database server that hosts DriveWorks shared groups. Pro Server itself does not require a license/activating to run. Select the licence that is to be returned and click "View"
A type of license that restricts the use of the software to a single computer. A type of software license that gives the ability to share a limited number of licenses among a large number of machines.